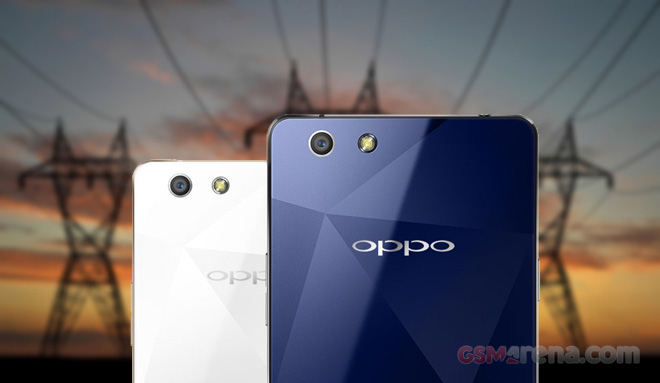 The Oppo R1x stunner of a smartphone was at our headquarters for a detailed review recently. We praised the 5-incher for its design and although it failed to impress with raw performance, it posted respectable scores in the battery department. It’s exactly battery life we’re going to focus on now, with the complete rundown now following. The Oppo R1x comes with a 2,420mAh battery capacity, which is a decent number in the midrange for devices with a 5-inch 720p screen. Main rival Sony Xperia M4 Aqua packs marginally less juice at 2,400mAh, and the cell inside the Samsung Galaxy A5 is rated at 2,300mAh. Talk times were the least impressive area in the R1x’ battery performance, and the smartphone only managed about 12 and a half hours when connected to a 3G network. 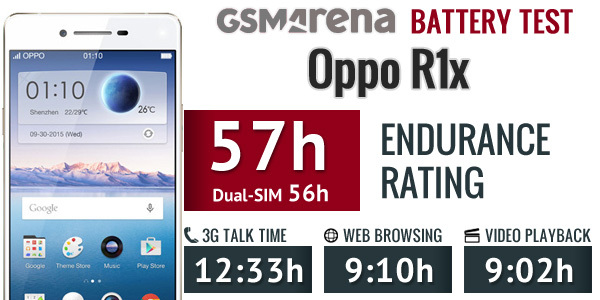 The Xperia M4 Aqua did better at nearly 16 hours, while the Galaxy A5 was miles ahead at 18 hours. Its in our web browsing routine, where the R1x scored more points. A result upwards of 9 hours means you can surf an entire work shift and still have some leftover battery for a call or two on the way back. In all fairness though, both the Xperia M4 Aqua and Galaxy A5 last upwards of 11 and half hours in this test. The video playback result was just a smidge over the 9-hour mark, and the similar longevity to the web browsing test indicates that it’s the display that has the main say on the matter, not the processing or software optimization. It also means that you can safely rely on the R1x to entertain you on your daily commute, or even much longer trips. The Xperia M4 Aqua and the Galaxy A5 have nothing on the R1x this time, both their scores are in the same 9-hour ballpark. The R1x didn’t do too well in terms of standby times, which hurt its overall result. Still, the 56-hour endurance rating is a good achievement, and if you use the phone for surfing the web or watching videos, you won’t be affected so badly by the high standby power drawe. Our battery testing procedure is described in detail in case you want to learn more about it. If you are interested how these results compare to other tested devices, check out our battery life test result table.